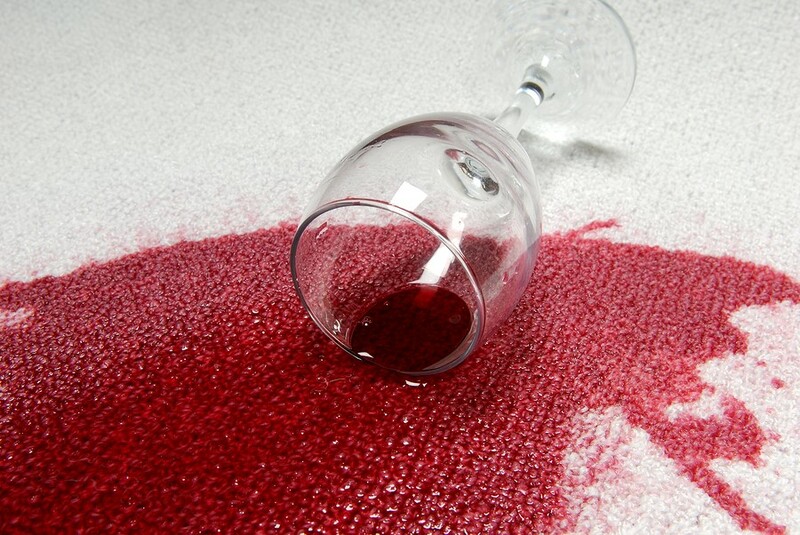 A red wine glass spills onto the carpet. Yikes! The sooner you act the better. 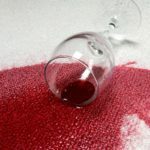 Attacking the red wine stain before it fully sets into the carpet gives you a better shot at getting rid of it. The following are good stain removal remedies, but remember, to ensure color fastness, I always suggest you test any removal method on a discreet spot of carpet before treating the stain. First, BLOT. Time is of the essence, so grab a clean white cloth (towels and paper towels work just fine) and press the cloth to the stain. Soak up as much of the red wine stain as you can by moving dry parts on the liquid. Be careful not to rub, rubbing can push the stain deeper into the carpet’s fibers. After you finish blotting, you can pour a bit of cold water directly onto the wine stain (Be sure not to pour too much at a time). This helps dilute what remains, making blotting a bit easier. Continue blotting until no more of the stain will come out. Two, If You Can’t Treat It, Salt It. Don’t have time to treat while playing host to your guests? After you’ve finished blotting, pour salt onto the affected area. The salt helps absorb the stain and can be quickly removed with a vacuum when you’re ready to treat the stain. Don’t have salt? Baking Soda can also be used. Home Remedy #1 – Plain Club Soda is a good home remedy because of it’s carbonation and sodium components. Apply club soda to the red wine stain and blot. (Be sure not to pour too much on at a time). Home Remedy #2 –Mix 1/3 of a cup white vinegar with 2/3 of a cup water. 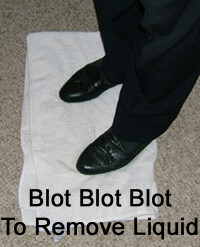 Saturate red wine stain with the vinegar solution and blot with a clean towel. (Be sure not to pour too much on at a time). Four, Attacking what is left. After blotting either the soda or white vinegar mix, combine 1/4 teaspoon liquid dish detergent (Dawn® is a good choice) with 4 cups of luke-warm water. (Note: Make sure your dish soap is free from bleach and lanolin). Spray or gently pour a small amount of the dish soap solution on the stain. Using a gentle blotting motion, work the detergent into the stain and continue as needed until stain is gone. Then remove the soap by spraying the treated area with water and blotting. Previous PostPreserve Your CarpetsNext PostEver noticed a dark line along the walls on your carpets?